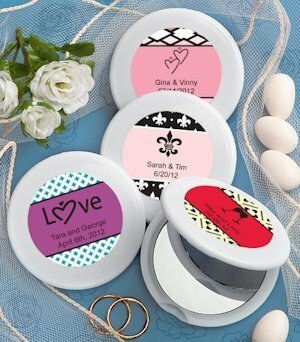 Reflect your style with these great personalized compact mirrors favors! A design for any event, your guests will love taking home this functional yet fashionable memento. Designs for every season, each 2 1/2" round compact mirror has a double sided glass mirror interior with a sturdy white poly resin outer compact case, hinged for easy open/close. Personalization included, choose from a variety of designs and colors along with 2 lines of custom text to create a one-of-a-kind gift. Some assembly required. Personalized labels are self-sticking for easy application. Yes, you can add a text on your design. You can add 2 text lines maximum of 20 characters on each line. I just uploaded an image of text in blue, will it print just as it is uploaded? 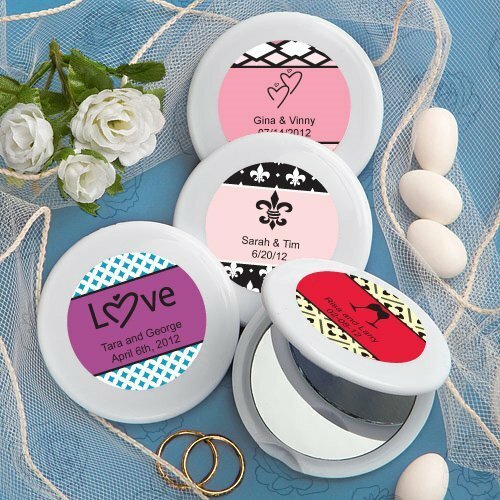 When you use your own photo design for this Personalized Compact Mirrors Favor, it will only print the photo within the circle so make sure when uploading a photo it is centered. You can drag the photo to adjust. Do you offer free shipping or any kind of bulk deal for an order of 2,000? Are we able upload a custom graphic and if so, are we restricted in the number of colors in our graphic??? I'm sorry we do not offer free shipping but we have discounts for large orders. You can also upload your own photo and make sure the quality of the photo is good. I only need 30 mirrors, is that possible? Sorry, the minimum quantity you can order with this Personalized Compact Mirrors Favor is 60. I need to order this Compact Mirrors as a tax exempt item, what shall I do? We only charge sales tax if shipping to Minnesota or Florida. If shipping to West Virginia, then you will not be charged a sales tax.